Alvin Zhou is not your typical video producer. On a recent fall afternoon, he's hovering over a table in a test kitchen cutting and prepping vegetables and meat that he'll later whip into an ersatz "fried rice" dish made with cauliflower. As I watch, I'm offered a hot chocolate chip cookie topped with sea salt straight out of the oven. A camera hangs above Zhou's workspace to film each step of the cooking process, creating a video that, after editing cuts, employs a minute's worth of fast-paced, simple shots of his hands. He's carefully going through the recipe steps to help people recreate the dish at home. No, this isn't the test kitchen of Bon Appétit, Food & Wine or any other high-end foodie title. This is the New York office of BuzzFeed—the viral digital publisher founded 10 years ago by new-media whiz Jonah Peretti, credited with creating the internet's most addictive content. Data inform Zhou's programming choices. As an example, recipes that swap vegetables for starches—like the aforementioned fried cauliflower instead of fried rice—have soared in views in recent months, which explains today's shoot. And the video includes four variations on the dish, with chicken, pork, beef and vegetarian versions. The diverse offerings are meant to encourage people to share the clip with their friends and family. 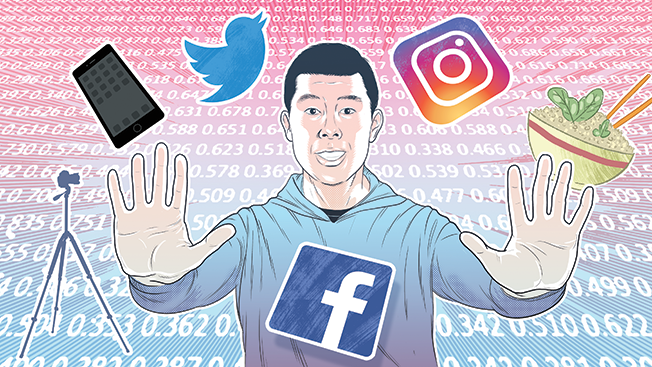 "Every single video that comes out, I look at it, I analyze it, and over time, I'm able to get a sense of what numbers I'm looking for or what number signals a viral video within the first hour," Zhou explains. He adds, only half-joking: "I refresh the Tasty page at least 200 times a day." BuzzFeed's food brand Tasty exemplifies just how crazed publishers are in chasing digital video—a $10.3 billion industry this year that will be worth $12.5 billion in 2017, per eMarketer estimates. In 15 months, Tasty has created 2,000 recipe videos that in aggregate reach a staggering 500 million people a month—and the brand counts more than 100 million Facebook fans. In September alone, Tasty generated nearly 1.8 billion—yes, billion—views with 1.6 billion of those views coming solely from Facebook, according to data from video analytics company Tubular Labs. BuzzFeed's initial impact on the media world a decade ago came via its popular online listicles, slideshows and quizzes, but it's also sprinkled serious journalism into the mix in the ensuing years. So consider Tasty part of BuzzFeed 3.0, which is laser focused on mastering video that's distributed on Snapchat, Facebook, Instagram and YouTube. "When something really works in a country, we're learning how to adapt it to other countries. And when something really works on one platform, we're learning how to adapt it to other platforms," notes Peretti. "It's not just you make something and then you can put it everywhere. You can make something, learn from your audience and then adapt it for other places." True to BuzzFeed's style as an R&D lab for modern-day publishing, making a Tasty video is equal parts science and art. In fact, what's captured in data after Zhou's videos go live is as important as making them. Based on past stats, a 75-person team can effectively predict a clip's buzz factor before it's even published. Coupled with proprietary analytics technology that determines the right platform and time when a piece of content is most likely to spread like wildfire on social media, Tasty videos score millions of views. Then, the stats are obsessively pored over for deeper insights and best practices moving forward. To get an idea for BuzzFeed's complex distribution strategy, consider how a recent Tasty video for butternut squash pasta rolled out online. A 73-second video was first published to YouTube, where it racked up more than 65,000 views in 22 hours. The next day, a shortened version of the clip—65 seconds—posted to Facebook generated 4.4 million views, 19,500 shares and 52,000 likes in four hours. Meanwhile Zhou's cauliflower dish was published simultaneously to YouTube (as a two-minute-and 23-second video) and Facebook (as a two-minute-and 16-second video), generating 91,000 and 8.1 million views, respectively, within 22 hours. That is social video at its most effective. Those types of statistics represent just the tip of the iceberg in terms of data that Peretti and his teams collect and analyze. Specifically, they fixate over a stat called "share rate" that tracks how many people socially pass on a video to friends and family divided by the total number of views. A well-performing Tasty video, for example, generates a 1 to 3 percent share rate, and the average video is shared 165,000 times. "We see shares as a better metric of success," notes Ashley McCollum, general manager of Tasty. "Many people scroll by something on Facebook and watch it for a second or three seconds and then they drop off to something else. But someone who would watch it to the end and then share it is a great signal that that piece of content means something."